Sphagnum moss sure is an amazing plant! I’ve been hanging out in some wetlands lately, and with our son Todd attaining his 20th birthday, and a bunch of my friends having babies, I couldn’t help but reminicse about this old rolling stone’s moss gathering activities a couple of decades ago. I hope you enjoy this piece. Lemmie know how your moss gathering goes. I just couldn’t get it out of my head! William Wasowich, one of the last South Jersey moss rakers hard at work in 1992 in a Pine Barrens sphagnum bog. Wasowich was one of the characters mentioned in John McPhee’s book, The Pine Barrens. Ever since I had seen the article in that old National Geographic Magazine about the Cree Indians, I hadn’t been able to get that picture out of my head. It showed a young Cree mom diapering her baby with sphagnum moss. Wow! What a concept! I knew sphagnum moss well. I had seen it many times in my wanderings in wetland areas in various parts of the country. I had marveled at its pale green color and its soft, absorbent, spongy texture. I had picked it up by the handful and marveled at how much water I could squeeze out of it. One time I did a test with a bunch of dry sphagnum and a sensitive scale. I found out that it would hold 12 times its own weight in water. Sphagnum’s remarkable ability to soak up water is why it is so important in nature. Because of its water retaining properties and its ability to create and maintain an acid habitat for itself and other plants, sphagnum plays a key role in the formation of bogs. Bog environments act like huge sponges that control erosion on mountain slopes and flooding in valleys. In fact the drainage of almost all the vast northern regions of our planet is controlled by sphagnum moss. 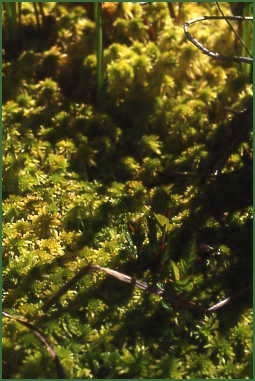 Sphagnum moss deposits also provide a medium for the seeding of trees and other plants that are important in the development of northern forests. The peat moss that we buy to mulch our shrubs and mix with potting soil is primarily ancient sphagnum moss that has been mined out of former bog areas. William Wasowich, one of the last South Jersey moss rakers hard at work in 1992 in a Pine Barrens sphagnum bog. I had spent time with traditional moss rakers in southern New Jersey. These backwoods folks, known as “pineys”, who live in the relatively undisturbed and ecologically unique area known as the Jersey Pine Barrens, rake fresh sphagnum moss out of bog areas, dry it and bale it for sale to nurseries and garden centers. Sphagnum moss also has a long history of use as a wound dressing, reaching a peak in its use during World War I when it was used by both the Germans and the Allies. By the end of the war, the British production of sphagnum dressings was estimated to have been about one million pounds a month. Well the time had come. My wife was pregnant and the nesting phase had begun. The nesting phase is that time during pregnancy when many women get seriously focused on “preparing their nest” for the arrival of the new baby. From knitting tiny garments and shopping for blankets and diapers, to preparing the cradle, crib, playpen and other neonatal accoutrements. The nesting phase is a busy, exciting time in an expectant mother’s life. As an expectant dad, I found my own nesting instinct had kicked in powerfully and now this old rolling stone was scurrying around in bogs gathering every bit of moss he could find. By the time our little one was due, I had stored away several big bags of carefully dried sphagnum. What marvelous material it is. I can’t say that it was the only diapers we used because we tried all kinds. But sphagnum was our favorite, not only because it is natural and biodegradable but because it was simply, the best. The moss seems to wick moisture away from the baby’s skin and the tiny dry particles of moss act almost like a talcum powder so that the baby’s skin stays smooth and dry. Feces is absorbed and enclosed in a wad of moss. Because of these properties, as well as the fact that the moss is slightly acidic and is reported to contain small amounts of iodine, sphagnum can be helpful to prevent and heal diaper rash. I realized that not only were we being gentle on the earth and giving our baby the best care available but we were also, in some ways, tapping into our ancient heritage because sphagnum moss was used by our northern European ancestors as well as native North Americans. I asked a native-American friend, who is a speaker of Cree and other northern Algonquian dialects about sphagnum. He told me about how it is still used in the back- country. Mothers wrap their babes in a soft buckskin bag filled with dry sphagnum and change it as necessary His people use the word “otaow” (rhymes with cow) to refer to sphagnum moss. When I asked him about how the word translates, he said the root of the word, “ota,” is associated with the word for father. “Is that because the fathers gather the moss?” I asked expectantly. This root word, “ota,” he went on to say, is a word that implies presence, meaning something like “right here” or “being there.” I thought about how fatherhood had imbued the words “presence” and “being there” with new meaning for me. “Is that because it’s used for diapers,” I asked. “Not necessarily,” he replied (again), explaining that it is more because of the way the sphagnum covers the ground — like a carpet in some moist areas, growing over rocks and logs and everything — protectively holding the Earth Mother. When I would protectively embrace and hold my young son in my arms, I would sometimes think about our responsibility to protectively hold all that we touch. When I think about that spongy wad of sphagnum moss in our son’s diaper, I marvel at the vast millions of acres of sphagnum moss that are currently embracing our planet, protectively holding, and ever so gently, softly, controlling the flow of the countless trillions of gallons of water that drain boreal land masses all around the globe. That wad of sphagnum tucked in our child’s diaper, containing the fluids and mopping up our own baby’s nether regions seemed like a wonderful parallel – sort of a microcosm of what is happening on our planet every day. To gather sphagnum moss for baby diapers, it should be picked as clean as possible and promptly dried. When gathering moss I generally carry a tarp or large drop cloth, a pillowcase and /or a pack basket with me into a bog area. Late spring and early summer seem to be ideal times to gather because there is a lot of new tender growth. Boots, amphibious sandals or wading shoes are recommended. In the boggy areas where sphagnum is found, it usually grows as the first layer of vegetation, anywhere from a few inches to a foot or more in depth. It forms a moist, fluffy substrate with various other plants poking through. These might be tufted sedges, delicate flowering orchids, exotic looking pitcher plants, robust red cranberries, or low thickets of pink-flowering sheep laurel and wooly-leaved Labrador Tea. Sometimes sphagnum moss will completely cover a partially submerged fallen log or creep up the base of a tree trunk. The best places to gather the moss are the more open areas where it grows in thick clumps or beds. From areas like these you can pull one handful after another and still leave large amounts to regenerate. When gathering moss, (or any natural resource) it is important to diffuse your impact, taking a few handfuls from one clump then moving to another. Of course it is important not to gather in an area where the moss is not common. You will see, however, that in areas where moss is abundant, you can pick for a few hours in a relatively small area and there will still be so much moss left that it will be difficult to tell where you have harvested. Pick the moss as cleanly as possible, removing pine needles and other bits of debris when you find them. (There will be more opportunities to do this when you spread it out to dry later.) When I pull the moss, if the bottom of the clump is muddy where it was rooted in the bog, I cut or break this part off. I collect the moss in a gathering basket or a sack. When this container is full I carry it to the edge of the bog, ideally to a sunny area, and spread the moss out on a clean tarp or large cloth and go back for more. The moss dries amazingly fast if it is spread thinly. If tarp space is limited and the moss is piled rather thickly it will still dry in a day or two, especially if you turn it regularly and break apart the moist clumps. A few hours of gathering and a day or two of careful drying can yield several months’ worth of sphagnum. The use of a tarp is important to keep the moss clean and away from contact with the soil. This will virtually eliminate the risks of sporotrichosis, a fungal infection that sometimes affects greenhouse workers who work with sphagnum. Recent studies indicate that the offending fungus, Sporothrix schenckii, lives in the soil. It has not been found (and apparently will not grow) on living sphagnum moss. It can be a problem, however, in greenhouses where the dead moss is mixed with water and dirt and allowed to stand for extended periods in a heated environment. (1) Footnote: (1), Mycopathologia 123: 87-94, 1993. Though some of our friends lay the sphagnum moss on a cotton diaper, we find that a moss filled nylon diaper cover works best for us. To prepare for diapering, open the diaper cover and place it on a flat surface. Place a couple handfuls of the moss in the diaper cover and arrange it “strategically” (more in front for boys). Examine the moss carefully to be sure it is free of leaves, pine needles and other potentially uncomfortable debris. (I press the moss into place with the back of my hand to be sure it is soft and free of projections.) Sometimes we use different “grades” of moss. 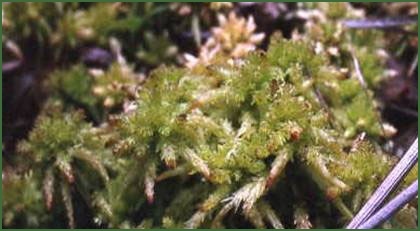 The softest moss is reserved for the inner layer and the rest is used as the “backfill”. Sometimes we place a few sheets of toilet paper on top to cover the moss. Then we set the babe down onto the moss and fasten the diaper up as gracefully as possible. Since managing a squirmy baby on an easily scatterable pile of moss is not always easy, having an extra person helping usually makes it easier. (We call it “tag team diapering.”) Once the diaper is fastened we found that training pants or rubber pants help hold the whole assembly together. The moss seems to wick moisture away from the baby’s skin and the tiny dry particles of moss act almost like a talcum powder so that his skin stays smooth and dry. Feces is absorbed and enclosed in a wad of moss. Because of these properties as well as the fact that the moss is slightly acidic and is reported to contain small amounts of iodine, sphagnum can be helpful to prevent and heal diaper rash. We used moss primarily as a travel diaper and it was amazingly simple. We could go for weeks with only a stuff bag full of moss and two or three nylon diaper covers. While one cover was on the babe, the other, after being rinsed was drying out. Our youngster, as fussy as he was about diapering in general, never did develop an aversion to the sphagnum. When he got to older toddlerhood, he would even help us tuck the loose pieces of moss into his diaper cover. Of course using such an unusual method of diapering does leave you open to a few raised eyebrows as well as the occasional wisecrack. One friend watched us undo our son’s diaper. When he saw the huge wad of soggy moss he asked, “Don’t you think that boy has a little too much fiber in his diet? Hi, Doug! I’m so glad reading this article. Im still looking for many source about nature diaper for my book’s project. So, I felt so lucky when reading your story. May I use your story as one of my reference? Thanks before. Have you ever heard of anyone (child or caregiver) developing Sporotrichosis from using Sphagnum moss? I worry about putting this moss so close to my child’s most sensitive orifices.